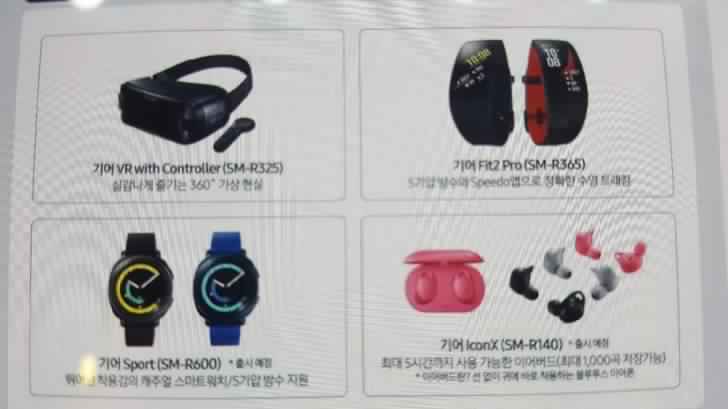 There has been a lot of news in the past that the Korean giant, Samsung will not only announce its Gear Fit 2 Pro watch at the IFA annual exhibition on smart devices in Berlin in September. Samsung will announce more than one device. Samsung is expected to reveal for the first time the Galaxy Note 8 and its smart watch Gear Sport with the model number SM-R600. The Korean company is a leader in the manufacturing of smart devices, many watches designed by Samsung usually come with a circular screen, and will not differ greatly from the series Gear S, which includes the heart rate sensor, the watch suits the athletes dramatically. The watch is suitable for swimmers as they have many of the advantages that serve them during swimming, such as their ability to track the number of twists and calculate the movements of swimmers in the water. It will be the first Tizen 3.0 smart watch to support Wi-Fi and Bluetooth connectivity. According to the FCC, the watch will not support a port for the connection and will not support 4G LTE. Samsung customers are also expected to unveil the new Samsung Galaxy Note 8, which will have excellent capabilities and will come with Samsung S Pen and a large screen size 6.3 inches, and will give you everything you need in a smartphone. Date of announcement: August 2017. Date of issue: September 2017. Phone structure: The phone is made of metal, covered with Corning Gorilla V version, phone length 162.5 mm, width 74.8 mm, 8.6 mm thickness, the phone weighs 195 grams. Protection: The body of the Galaxy Note 8 is surrounded by a Corning Gorilla glass version 5. Water and dust resistance: The Galaxy Note 8 resists water at a depth of 1.5 meters up to 30 minutes and also resists dust. Color: Available from the phone Color Golden, Silver, Black, Blue. Screen: Featuring a Super AMOLED touch screen that supports 16 million colors. Screen Size: The phone comes with a 6.3-inch screen that occupies 83.2% of the phone’s surface. Screen quality: The phone screen is expected to come in 1440 * 2960 pixels with a pixel density of 521 pixels per inch. Screen Protection: A Corning Gorilla glass protects the screen, the fifth version is resistant to scratches and fractures. Operating System: The phone comes with the seventh version of Android operating system 7.1.0 (Noga). Phone Processor: The phone comes with a powerful eight-core processor from Qualcomm American Snapdragon 835. Graphics Processor: Includes the Adreno 540 graphics processor. Random memory (RAM): 6 GB. Internal memory: 64/128/256 GB, and a microSD memory card slot up to 256 GB. Rear Camera: Features 12-megapixel dual-sensor camera The first f/1.7 and f/2.4 lens supports auto focus, and dual LED flash. The Sylvie front camera: 8 megapixels with an f/1.7 lens that captures 1440-pixel video at 30 frames per second. Video Recorder: Supports video capture at 2160p at 30 frames per second. Battery: Contains a non-removable 3300 mAh lithium-ion battery and also supports fast charging.